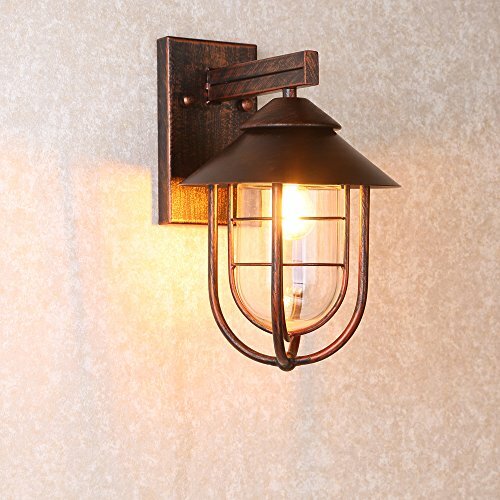 Taking on nautical style, this single-light wall sconce is designed in a classic styling, perfect for both indoor and outdoor lighting. The clean-lined metal wire cage topped with cone shade encases a clear glass shade for an intricate sense. Hanging under the light arm on a rectangular backplate, this design performs a handsome and attractive look. When lit, it emits and diffuses light to create a bright and serene environment with ease. An antique copper finish gives this design a wonderfully industrial feel. Light up your spaces with it! If you have any questions about this product by Jiuzhuo, contact us by completing and submitting the form below. If you are looking for a specif part number, please include it with your message.